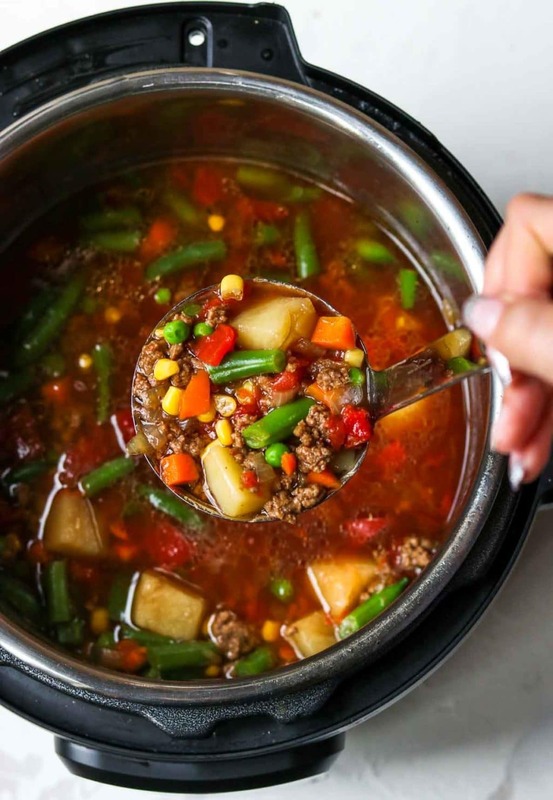 Instant Pot Hamburger Soup is an easy and fast instant pot dinner recipe, that only cooks for 4 minutes! 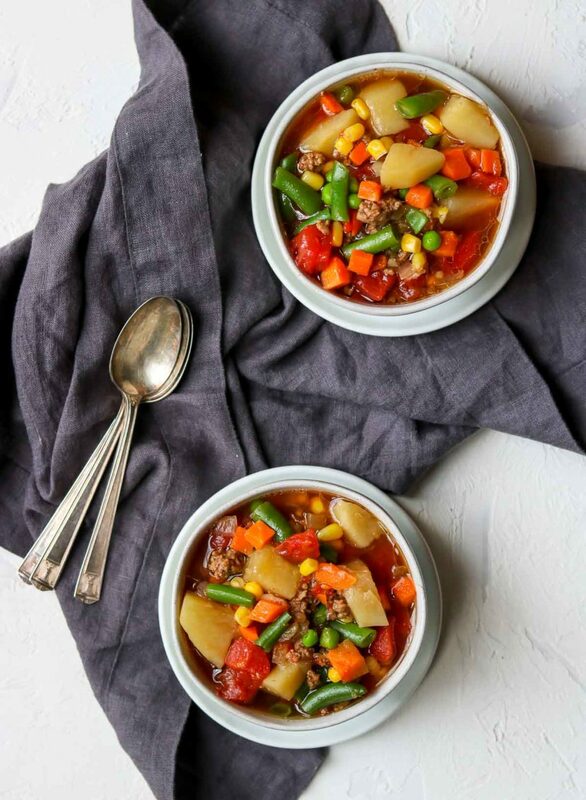 This is a healthy soup recipe that is full of veggies and protein and can be easily put together on a busy weeknight. And we go around and around and around. This is what happens when there isn’t a dinner plan. This recipe for Instant Pot Hamburger Soup was born in the aisles of Target. After the conversation above took place, I decided that a vegetable soup sounded great. We grabbed a pound of ground beef, a bag of frozen veggies and the rest was already in my pantry at home. 20 minutes later- Violia! Dinner was ready. 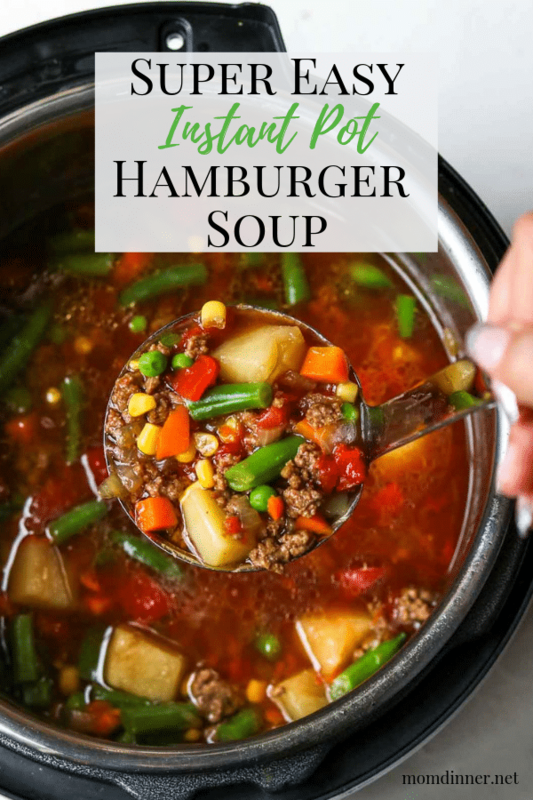 I love this Easy Instant Pot Hamburger soup because it is filling and super flavorful, yet it is a super quick dinner. It is full of veggies and protein, making it a healthier dinner option. I can always use a few more veggies in my diet, especially in the winter when all I want to eat is carbs and cheese. Right!? This is a healthier instant pot soup that you can add to your dinner rotation. 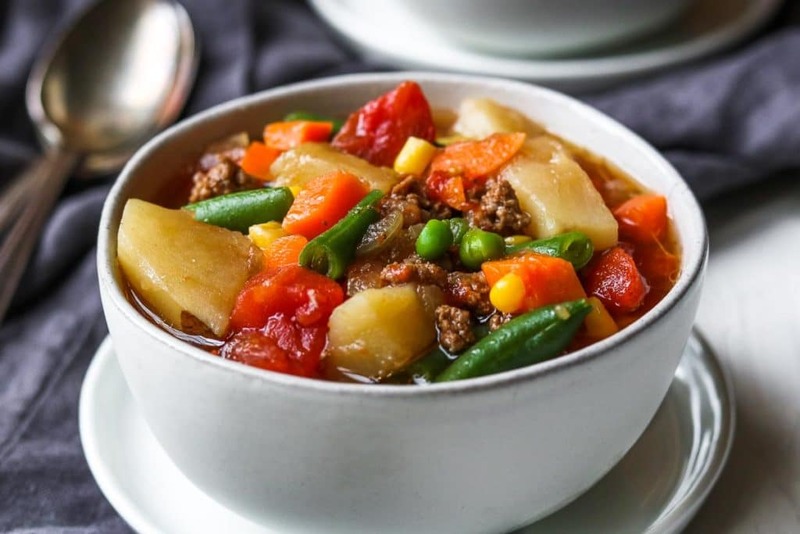 It is full of veggies and protein, and if you use lean ground beef (90/10) it is even healthier. Leftovers also make an amazing lunch. This recipe is so easy that you really do not need to make it ahead. But, I will say that it gets even more flavorful with time, just like chili. But, there are weeks where it’s hard to get an “easy” dinner on the table, I know from experience. So this is a great soup to throw together on the weekend and pop in the fridge for those crazy busy nights. It would also make a great lunch to take to work, or put in a thermos to send to school with your kids. I love my Instant Pot, which you should be able to tell from all my IP recipes! 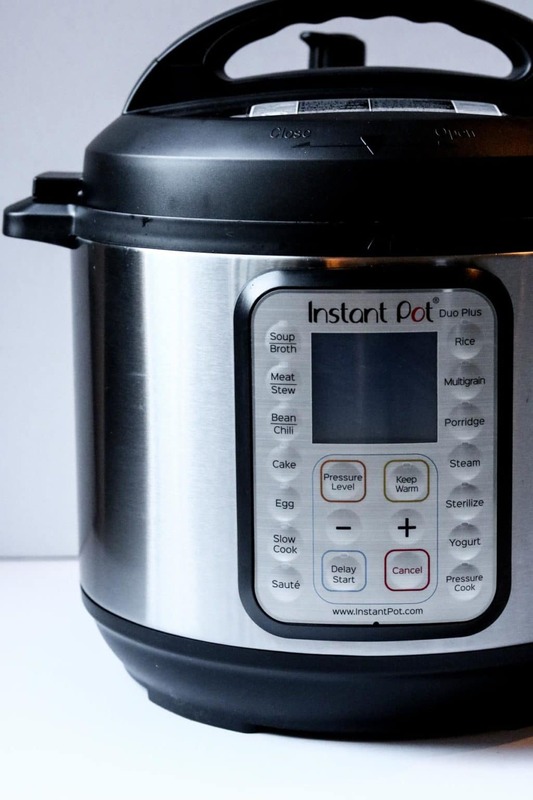 The pot I use and recommend is the Instant Pot Duo Plus 60 6 quart 9-in-1, the main reason I love this pot is because of the size, 6 quart. I don’t think I will ever get around to using all 9 features, but they are there if I need them. For this reason I also recommend the Instant Pot 6 quart 7-in-1, it’s a little less expensive, and it still gives you the 6 quart size. You will only be setting the Instant Pot for 4 minutes, just like in my Creamy Potato Soup. I love a fast and easy dinner recipe! First, set your Instant Pot to saute mode and soften the onions and garlic in the olive oil for about 3 minutes. Now add the ground beef and slightly brown the beef for about 5 minutes. Drain as much of the fat and grease as you can from the pot before moving on. Turn the saute mode off and add the Worcestershire sauce, potatoes, salt, pepper, optional rosemary, beef base, and beef broth. Give it a stir to “melt” the beef base into the broth. Pop the lid on and make sure that the pressure valve is set to “seal”. Set the Instant Pot to manual pressure mode, on high, for 4 minutes. Only 4 minutes!!! Next, add the diced tomatoes, tomato paste, and mixed frozen vegetables. Give the soup a few good stirs to dissolve the tomato paste. Let the heat of the pot thaw the frozen vegetables for a few minutes. I love adding the veggies last because they keep a little bit of their crunch, and cool the incredibly hot soup just a tad. 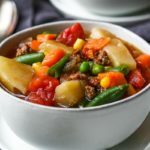 I hope you give this recipe for Instant Pot Hamburger Soup a try in your kitchen. 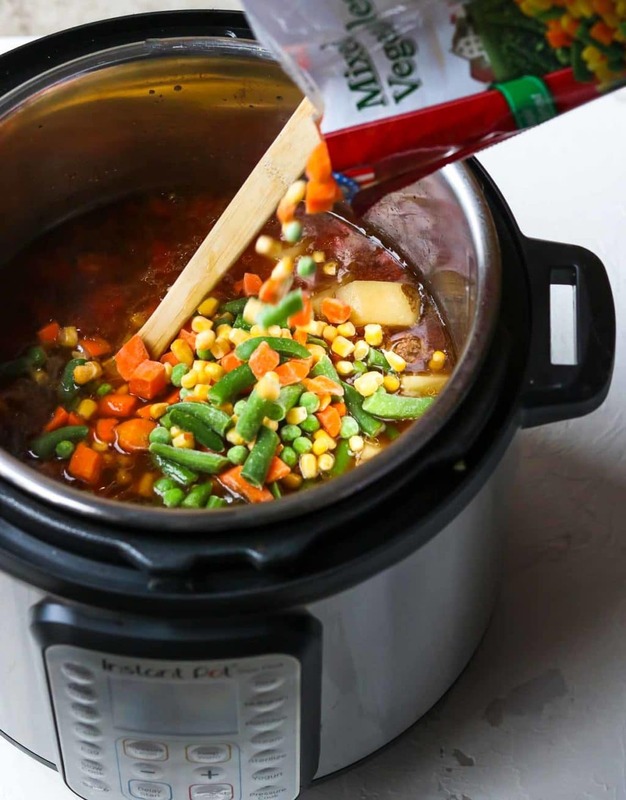 SAVE THE RECIPE FOR EASY INSTANT POT HAMBURGER SOUP FOR LATER, PIN IT HERE. With your Instant Pot on saute mode soften the onions and garlic in the oil for about 3-4 minutes. Add the ground beef and cook, while crumbling for about 5 minutes (it's ok if it isn't cooked all the way thru). Drain the excess grease from the ground beef/onion mixture. Stir in the salt, pepper, rosemary (optional), potatoes, beef base, Worcestershire sauce, and beef broth, and give it a stir to incorporate everything. Turn off the saute mode, pop the lid on and set it to manual/pressure mode, on high pressure, for 4 minutes. Stir in the tomato paste until it is dissolved. Add the can of diced tomatoes and the bag of frozen veggies. Give it a stir and let it sit for about 5 minutes so the veggies can warm thru. Taste for additional seasoning (sugar, salt, or pepper). My fiancé is going to love this one!